Last week I got a most excellent question from Sasha at my about page. Using my timeintelligent function screencast Sasha created a workbook using YTD where he used one table with facts and dates in it. The problem he had was when created his time intelligent function he wasn’t able to use data from other columns than the date columns. In this blog post i´ll try to describe how the time intelligent functions work, what pitfalls are and how to solve them. When using Time intelligence functions like LASTDATE or DATESMTD, it is necessary to add another argument which is ALL (TimeTable). Without this only the selected dates are considered, and you can’t find the last month unless you are in the last month. As you can see in the screenshot this is indeed what happens, the function only uses only the current date context in the sum. 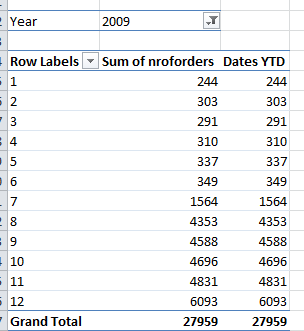 Returns all the rows in a table, or all the values in a column, ignoring any filters that might have been applied. This function is useful for clearing filters and creating calculations on all the rows in a table. When you know what slicers and filters you want to work with you can use an ALL() alternative: ALLEXCEPT(). With ALLEXCEPT you can pass through “a list of columns for which context filters must be preserved”. I would say use this option if you already know what you want to slice on and don’t have much time to solve it properly. Supply your users with a default time table in SharePoint/SSRS, they can import this by using the data feed option, use your DWH datetime table as source. you should create a relationship on the datetime column between the fact table and the the imported time table (make sure your datetime columns have identical granularity, like year, month, day, otherwise the join wont find results). With this relationship in place you now are able to use ALL over the datetime table. When you use ALL() over the separate time table it no longer ignores filters / slicers over your fact table. You now are able to filter or slice all the columns from the fact table you want. In the RTM version of PowerPivot the ALL() in the DAX function is no longer required, the separate time table unfortunately still is. My conclusion is that Time intelligent functions still are a very powerful feature but i am really disappointed on its user-friendliness, while these workarounds are easy for IT/BI personnel to grasp and implement, end users will have a harder time implementing this. 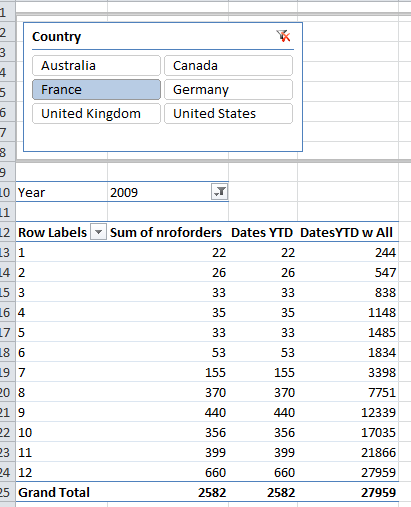 Maybe MS can implement a “add date time table” button in PowerPivot to automatically create a date time table to our PowerPivot tables to make it a little easier for end users to implement time intelligent functions. Uggg. I swear a time-lord would have fits over these things. I am not sure if I understand the work around properly (or if I can even get it to work). My sales (aka facttable) has the date field in it and I have multiple entries for the same date. It does have a unique – record ID field. 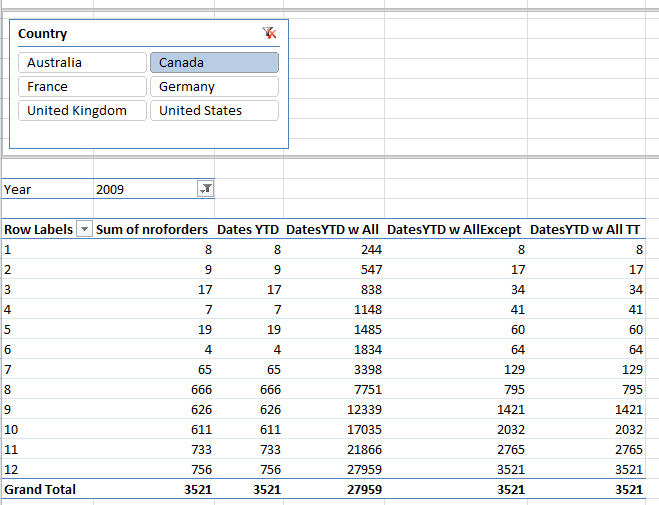 I made a copy of the Sales table, stripped out most of the extra columns and left the RecordID and Sales Date field. I think linked Sales with this called DimSales on the RecordID field. Q1. Despite the new date table, the ALL() still removed all filters from preset pivottables. Do I need to have it linked by the Date fields in order for this to work? Q2. 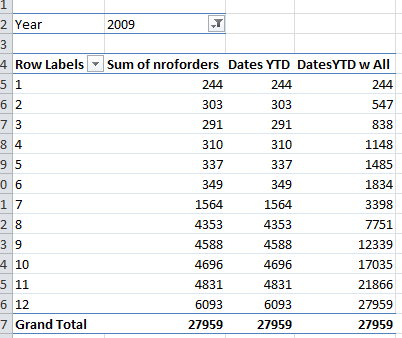 As I can not have distinct dates on my sales table, will putting distinct dates on my DimSales table omit sales entries as I have many sales per date? Q3. You state that with the RTM and future roll-outs, the necessity of the ALL() for time measures won’t be needed, but you state that a separate time table is still required. (a) Why? (b) How do you incorporate the time table in the measures if the ALL command won’t be necessary. (c) If you still need the time table, then what’s the point of removing ALL() as a necessary parameter? Sorry – you have answers (and a lovely Danish BI title now I believe – congrats!) that I need. Thanks. You were almost there as i can see from your questions, I hope my new post has answered your questions. For Q3 the all() indeed isn’t needed when you use the date field from your related time table as the date column to be calculated upon in your time intelligent function (as you can see in the example of my new blog post). I hope this answers your questions, if not don’t hesitate to ask! Actually it will work with the “ALLExcept” but it’s kind off “Not that intuitive” 🙂 But I am kind of worried that the “Books online” isn’t correct. Can you confirm that.. I think this will help you get the time intel functions to work as expected, the all function shouldn’t be necessary anymore. Spot on. I of course missed the import thing about relationsship with a date column. Which of course makes things a little bit harder since i never use date as key in my time dimension 🙂 Thanks.. I think we all never use a datetime as the key. There are several ways to work around this, you can create one using =date() if you have year, month, day available in you fact table. Thanks for your post. I was facing the same issue for some days and your solution has partially resolved it. Let me elaborate on what is still pending. Suppose in the above scenario I have one more attribute on the rows. This attribute changes across months. ie for April it is XYZ and for March it was ABC, then when using this calculated measure I only get data for ABC and not for XYZ. I am not sure if this is expected but what if such a result is required. Apart from that I have kept the datekey as a datetime column, created relationship between the fact and time dimension. Also the date dimension has continuous dates. Can you please give me an example from the output table? I think I understand the issue but would like to make sure. I have been working on a KPI where I show number of visits our sales reps are having each month. I show the KPI each month and I would like to be able to show the number of visits from the previous month. Thanks for your post, Kasper! It helped me a lot!! !